We are huge yogurt fans at our house. There is always a quart or two in the refrigerator. I love to bake with it. I think it helps ensure a nice soft texture. Yogurt is stirred in the batter of my sourdough muffins. It also makes an appearance in most if not all of my baked oatmeal recipes. We also love it topped with granola and fruit. Little Dude especially likes yogurt with blueberries or strawberries and coconut granola or maple cinnamon granola. I tend to almost exclusively buy organic whole milk yogurt, either plain or vanilla. 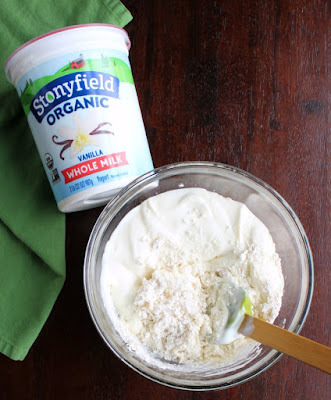 I read some articles about the benefits of organic whole milk dairy a while back and that got us started. Now we really prefer the flavor and texture. It is so good and feels good to do something that's both tasty and healthier for our bodies. 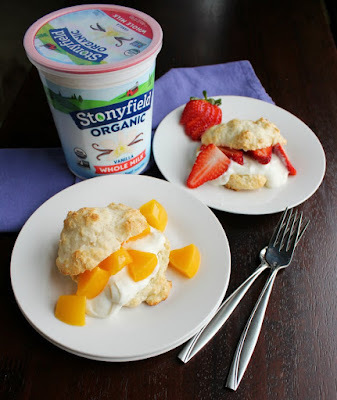 So I was super excited when I heard Stonyfield was sponsoring this week. Yo-baby was among Little Dude's first foods, so our history goes back a bit. It was tempting to make another flavor of baked oatmeal, but I thought it would be fun to do a little something different. Luckily these shortcakes came to mind. 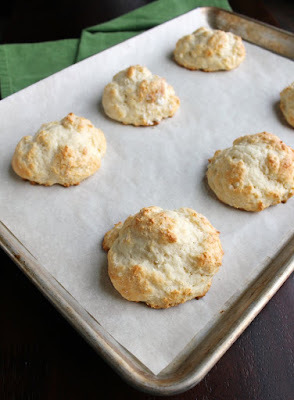 The drop biscuits are super simple to make. You can basically make them by doing a 1:1 ratio of yogurt and all-purpose baking mix (the kind you make biscuits and pancakes with). 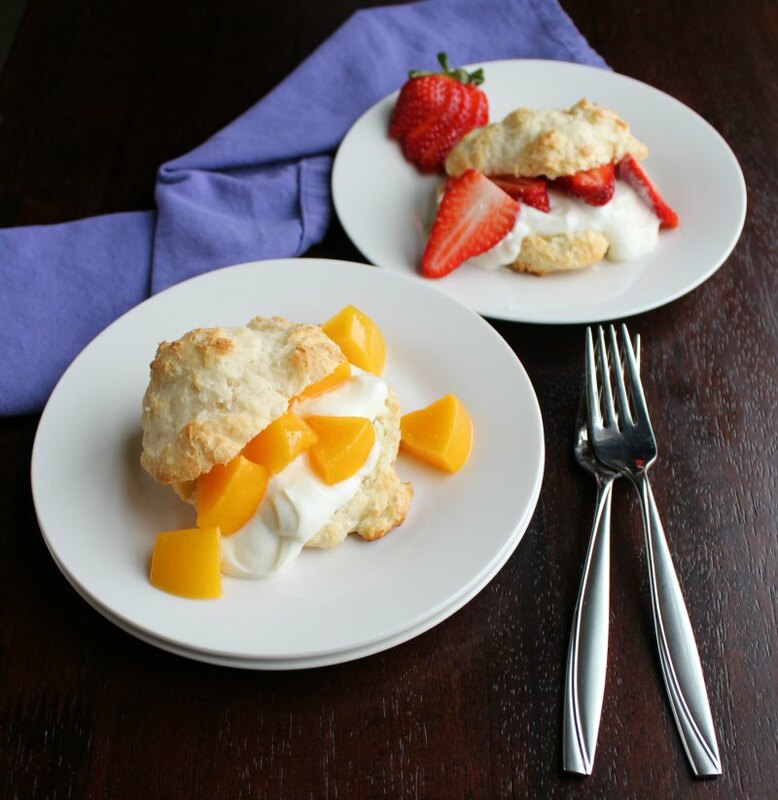 You can also make them with yogurt and a handful of pantry staples like I did. 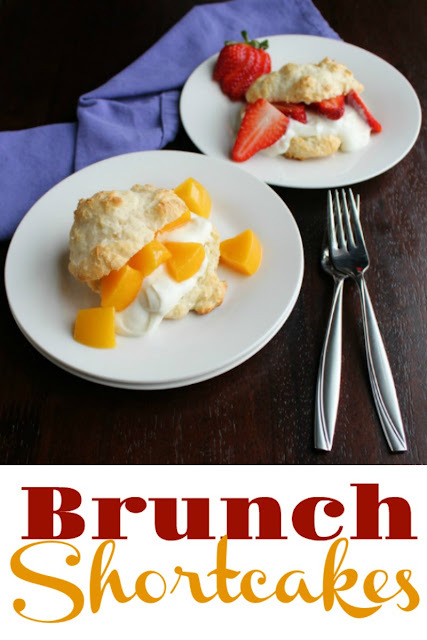 I used vanilla yogurt to make them lightly sweetened, but you could use plain yogurt for savory applications. 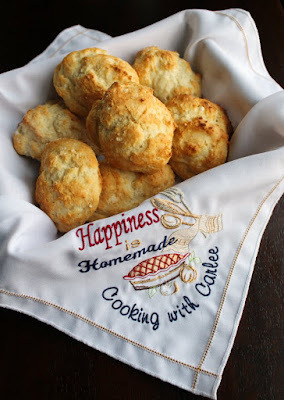 I love drop biscuits because they are not at all finicky. Just stir together a shaggy dough and plop it on a baking sheet. Because you don't have to knead or cut them, the batter can be looser and wetter to start. Thus the interior has a soft texture when they are done. Once the outsides are golden, they are ready. Just split them in half and fill them with vanilla yogurt and your favorite fruit. 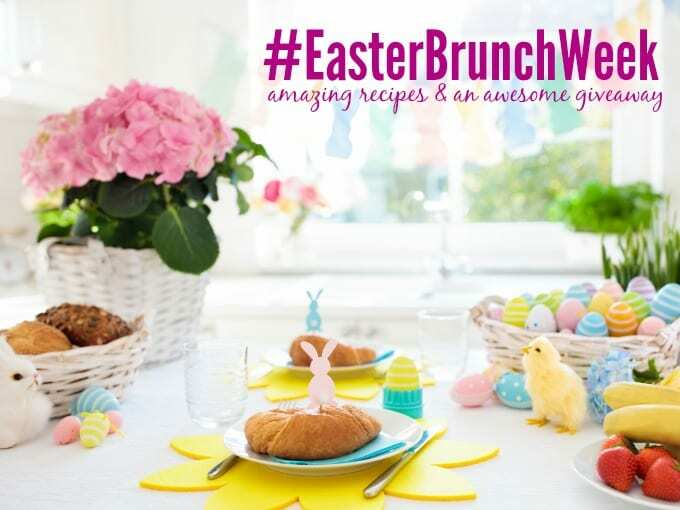 I hope you have been enjoying #easterbrunchweek as much as I have. This is my final recipe, so be sure to enter to win the prize pack while you can. Monday I have another fun treat for you. Hint: it involves chocolate and frosting! Stir in the yogurt and melted butter. The dough should be shaggy and moist. Different yogurts have different moisture content, so an extra tablespoon or two of flour or yogurt may be needed at this point. 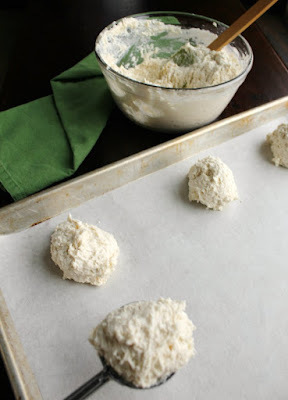 Scoop about 3 Tablespoons of dough onto the prepared baking sheet. Sprinkle with sugar if desired. Cut biscuits in half across the equator. Fill with vanilla yogurt and sliced fruit. I ❤️this! No cutting in butter and the addition of yogurt makes me think it's a little healthier. I can't wait to try this! I love that you use plain yogurt! I use to not be a big fan but now that I am all grown up, I love it! Ha ha! What a fun idea and a nice change for breakfast!